Porchetta with barbecue sauce and topped with a cube of Stilton. The DJ just turned up the volume. Someone who might be a Bruin stands by the door. The bar area flickers in the incandescent blue of a camera flash: a party to remember. Someone who might be a local news anchor settles into a curved white booth. Oversize white calla lilies arc beneath a ceiling covered in undulating white panels. A staff member passes by in a dress so minimal it might best be called an evening towel. There is enough female skin on display at STRIP by Strega that the name at first seems to reference both a cut of steak and the removal of clothing. But that is missing the real double entendre. This is the most Vegas spot in all of Boston. 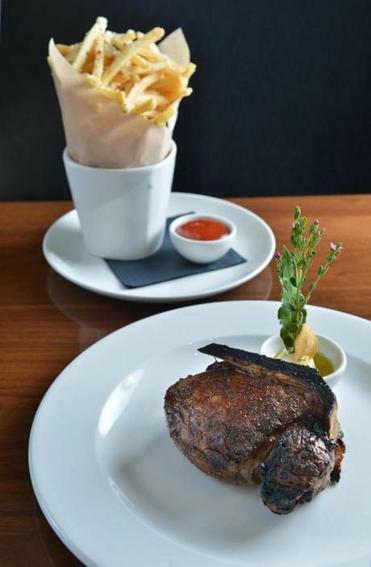 STRIP is restaurateur Nick Varano’s steakhouse. Strega is his empire. He’s got the original Strega, as well as Nico and the brand new Rina’s Pizzeria & Cafe, in the North End. 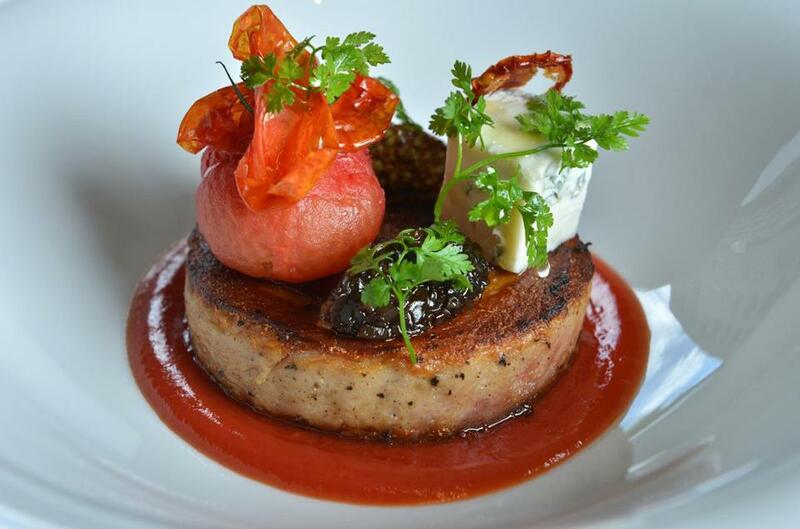 He’s got Strega Waterfront in the Seaport District and Strega Prime in Woburn. STRIP opened in April in the Boston Park Plaza in Back Bay. I’m guessing there will be more. It doesn’t much matter where Varano opens. The restaurants are like North End embassies, operating with the spirit and customs of Boston’s Italian neighborhood, plus a particular Varano something-something. He sold used cars, lived large, slimmed down. He had members of the “Sopranos” cast at the opening of Strega, where mafia movies play on a row of TVs. Jamie Foxx and Mary J. Blige attended the opening of STRIP. He courts celebrities and power players, but he is a friend to all. Everyone at the bar seems to know him. Everyone in the dining room does too. “I’m gonna go say hi to Nicky,” says a woman at every table at some point in the night. Every meal ends with a little copper glass of limoncello, on the house. Varano knows how to make people feel special. It’s not rocket science: He does so by treating them well. He trains his staff to do so, too, in a way that feels genuine. The beauty at the door, wearing a top with strategically placed mesh paneling, is out of everyone’s league. But there’s no cold shoulder here. “Hi, hon,” she says with a smile. “Is it still raining out there? It was so nasty today, huh?” A woman in a midriff-baring black ensemble slides into a booth occupied by three middle-age gentlemen and engages them with the skill of an Italian-American geisha. How she manages real conversation when the music is this loud is a mystery. STRIP can feel more like a club than a restaurant. Except for one thing. The food is really good. Seafood tower served in a fog of dry ice. 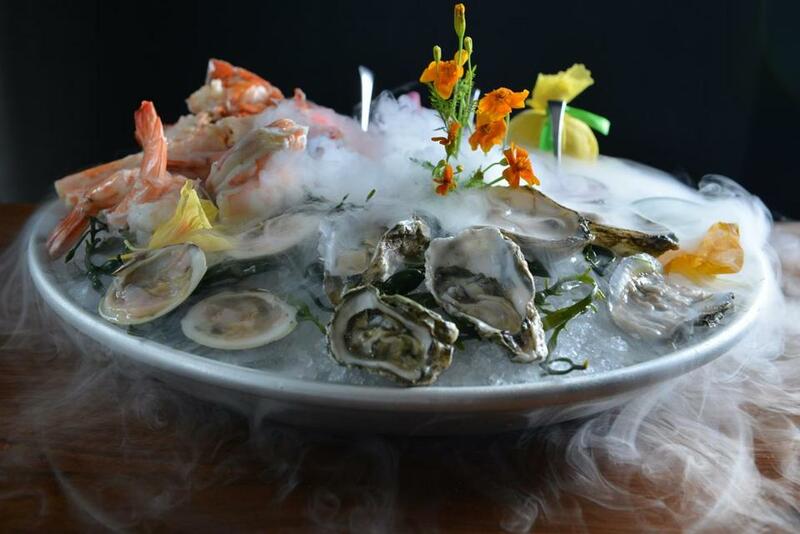 A seafood tower arrives with laughable drama, smoking like something out of “Spinal Tap.” The dish of granita-esque dry ice seems ill-advised — how long before someone dollops it on and gulps it down? But beneath the mist is a lovely platter of oysters, clams, shrimp, lobster tail, and crab claw. In this age of exhaustive cataloging of provenance, it is somewhat refreshing to have no idea whether we are consuming Wellfleets or WiAnnos. They are oysters, enough said. Executive chef Farouk Bazoune’s porchetta is deal-with-the-devil good: a rich, crisp, tender serving of roast pork in a swirl of barbecue sauce, topped with a cube of Stilton and dollops of mustard and shallot jam. The flavors — sweet, sharp, savory — play against one another and the meat beautifully. Wagyu carpaccio is a fine version, the thin slices of beef topped with pecorino, mustard, hot peppers, and tiny white pickled mushrooms, the best part. Seared gnocchi make an elegant first course, swimming in a buttery sauce with pieces of sweet, tender lobster. If there is a weak point at this steakhouse, it is the more-traditional steakhouse fare. Each steak comes with a gorgeous crust, but a bone-in filet is rarer than ordered and fatty. One can’t taste the dry-aging on a prime rib-eye, which lacks the typical flavor of the cut. Sides can be hit or miss — undercooked, tough Brussels sprouts with pancetta one night; fat, crisp-tender asparagus another. The wine list is deep and prices are steep. 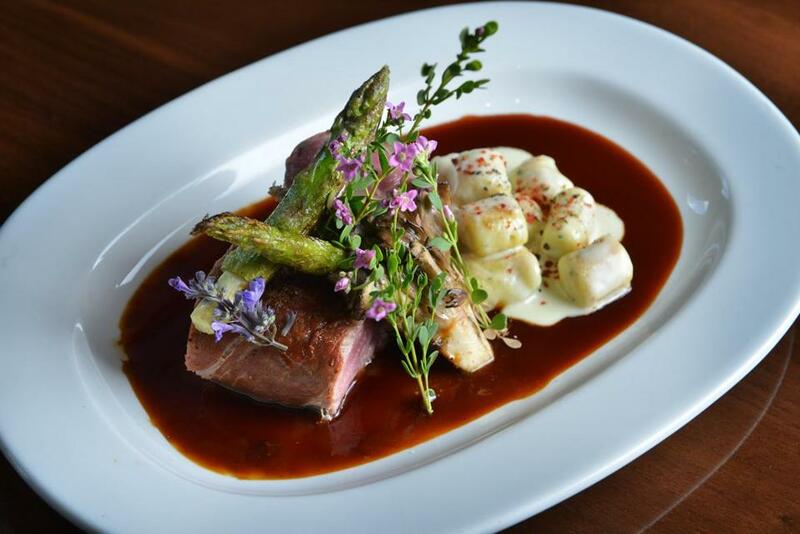 But give it up for the glories of veal tenderloin, wrapped in prosciutto and beautifully cooked, served with asparagus, maitake mushrooms, and gnocchi cloaked in a sauce of fontina. 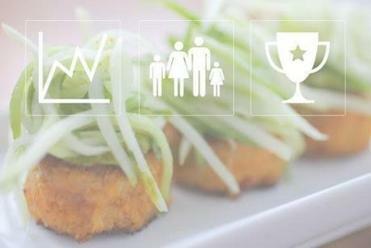 Pork chop Milanese is frequently flubbed at restaurants, the breading gummy, the flavors dull. Here it is just as it should be: simple, well seasoned, crisp outside, meat still juicy. Capers and lemon bring the dish to life, along with shavings of truffle pecorino. Truffle is frequently applied at STRIP — in the butter that comes with the steaks (sauces are extra), on the fries — but never overapplied. Veal tenderloin with prosciutto, maitake mushrooms, and asparagus. A bone-in filet with a side of truffle frites. Bolognese is served over pappardelle, nicely al dente. The sauce — made with Wagyu beef, pancetta, veal, and tomato — is almost too rich. Almost. A little less of it would let the pasta shine through. It’s not the only dish to suffer from excess. Bone marrow comes with hot peppers, pickled mushrooms, Gorgonzola, Port wine sauce, and a head of roasted garlic. Who can taste the marrow under so many assertive garnishes? And a 3-pound lobster is perfectly poached in butter, served in a supersized skillet with truffle cauliflower puree. Stop right there. Do not add the lobster reduction, a sweet, dark brown sauce that interferes with the lobster itself. For dessert, from pastry chef Suzanna Rourke, it is hard to quibble with a mini Key lime pie, topped with wee peaks of meringue and gussied up with passion fruit. (The plate is adorned with orchids. The flower budget at this place must be nuts.) And only the hard-hearted could fail to smile at whiskey-flavored cotton candy. A big white pouf, it presides over a row of house-made, Oreo-esque chocolate cookies and a smattering of Pop Rocks. It is an unabashed gimmick. It also looks and tastes great and makes everyone happy. It should be STRIP’s signature dessert. 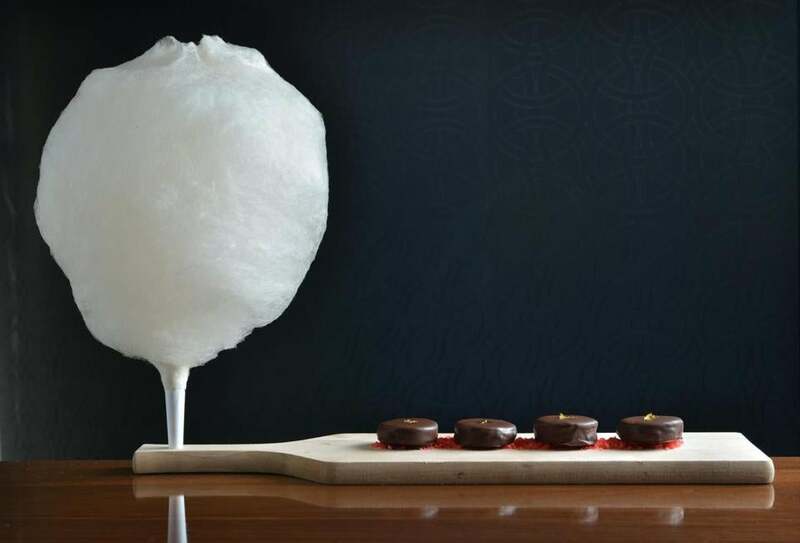 Whiskey-flavored cotton candy, with house made Oreo-esque chocolate cookies and Pop Rocks.